We decided to try the latest addition to the Edina restaurant scene. Via has taken over the old Pizzeria Uno space located on France Avenue across from Southdale. Via is run by the same company that operates Mission and Atlas Bar and Grill. I have dined at Mission several times but only for lunch. I find the food and the atmosphere good. Though I am still bitter about the fact that it is the old Aquavit space and well…it STILL hurts me that its gone. But not to fault the folks at Mission, it is a great location for a restaurant and they do a nice job. Now on to Via. I had some preliminary expectations about the Restaurant. Mostly that it would be Mission with a different name. Boy was I wrong. We had our first dinner there on the second day it was open. Usually day 2 of any new restaurant reveals the tough spots in the service and food. Not so at Via. Granted the dining room was about 1/3 full. So it was not all that busy. The service was almost too good. They were almost too attentive. The space itself is gorgeous. It has a huge 3 room dining area along with a large bar with plenty of table seating and a patio bar with fire pit. Our server was very knowledgeable about both the menu and the wine list. We tried several dishes on his recommendation. 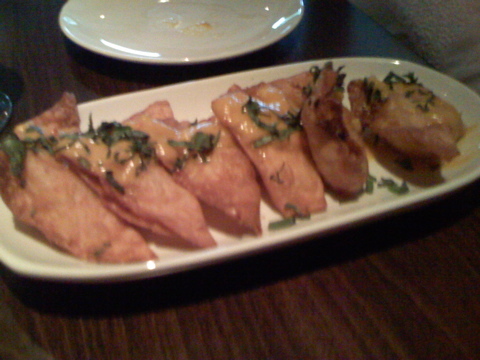 Our starters included the Coconut Rock Shrimp and the Crab Wontons. 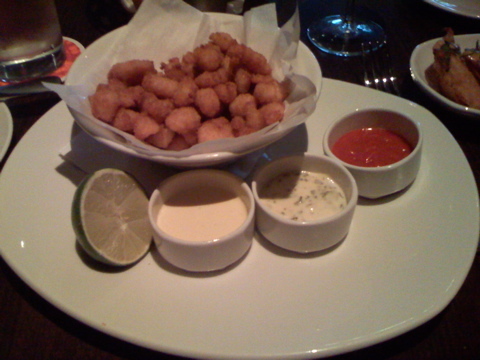 The shrimp were prepared well and the range of dipping sauces were nice. My favorite one was the Mango Ginger sauce. The hot chilli sauce was nothing all that unusual. The Lemon Herb sauce was fine but not all that interesting either when compared to the Mango sauce. My biggest complaint about this dish was that the presentation was boring. The crab wontons were also good. They were served with curry pineapple and basil. I think this is a great dish to share. 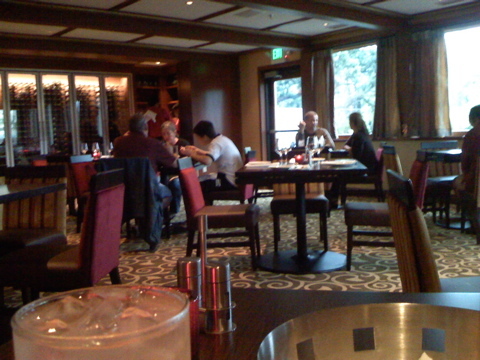 Also a good one if you just want to have appetizers and drinks in the bar. 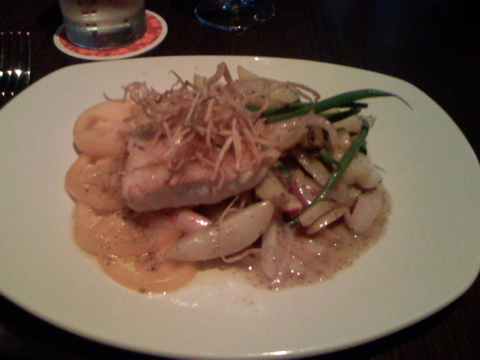 For entrees we tried the Halibut with golden tomatoes, lemon marmalade, haricot vert and fingerling potatoes. This was delicious. I was curious about the marmalade and how that would be integrated into the dish. It added a nice lemon overtone that was not overpowering. The fish was perfectly prepared along with the potatoes and green beans. I would highly recommend this. 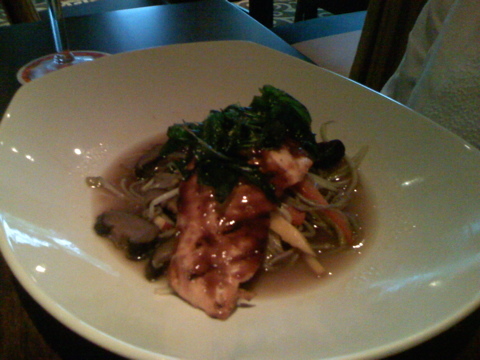 We also ordered the grilled salmon with soba noodle salad, shitake mushroom lobster broth and thai basil. I did not sample this due to my salmon allergy but my wife was very pleased with it. For dessert we ordered the mint ice box cake. 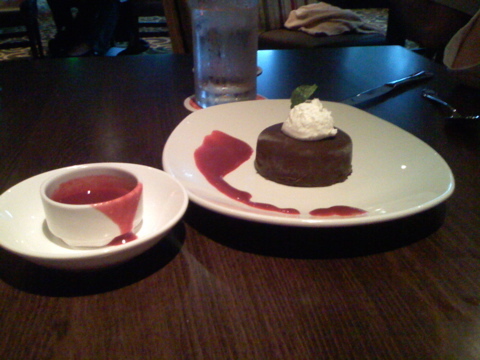 It was a chocolate covered and came with a raspberry sauce. I enjoyed this because it was chocolate but not to heavy. How can you really go wrong with chocolate, raspberry and mint. We made a second trip to Via for Sunday brunch. This time we had a bit different experience with the service. It was very slow which was challenging since my 3 year old was with us. Via is kid friendly but not in an Edina Grill kind of way and personally I think that is OK. They offer a menu for kids, and seem to have a reasonable selection. My son loved his blueberry pancakes. 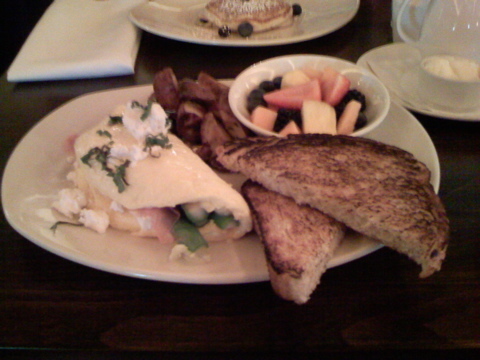 We tried the asparagus prosciutto omlette. I found the eggs to be very good, but the toast was over toasted and the potatoes were way over cooked. I think they had been sitting in a warmer somewhere for a really long time. Coffee was outstanding. Our server was not nearly as attentive as the dinner service. Must be that the B team is on Sunday Brunch. Overall, I think Via is going to be a very successful restaurant. It will be interesting to see how they evolve over the next 6-8 months. We had a very nice dinner at Peninsula recently. I had only been there for lunch in the past and I wanted to try more of their extensive menu. I find it difficult to remember the dishes by their authentic name so I will also give you the English translation. They have the entire menu on their web site. We started with 2 appetizers. The first was ACHAR (Malaysian pickled vegetable salad with peanut sauce). This was a recommendation from the person I was dining with. I did not like this at all. Not because it was not prepared properly. It was just not for me. 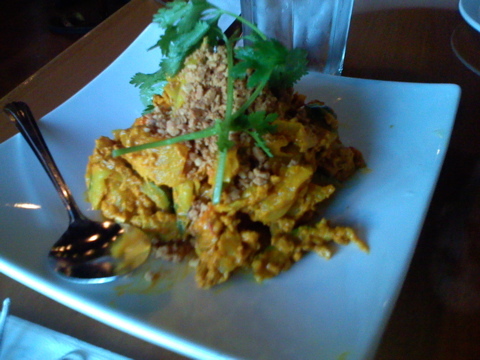 It is like a cold, curry pickled vegetable concoction that was somewhat chalky and covered with peanuts. If you like those combinations (at the time I thought I did) you’ll love this. We also tried the PENANG LOH BAK (Crispy fried spiced pork roll, taro, fried tofu & shrimp pancakes). This was really good. The fried pork roll was nicely prepared. I am not a big tofu fan but it worked nicely with the dipping sauces it came with. It also had pickled, ducks eggs. They are the black wedge-shaped objects next to the spoon in the photo. This would be an intimidating thing for most Minnesota diners. I will eat almost anything at least once … so I tried them. I have to say they were not what I was expecting. They were light and flavorful and tasted very much like hard boiled eggs. 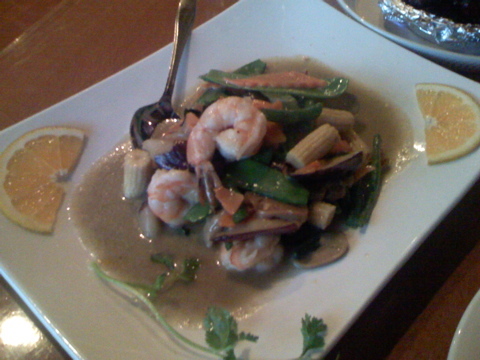 For entrees we tried the THAI GREEN CURRY SHRIMP (Thai coconut curry with Thai eggplant, lemongrass, green beans, peppers, fresh basil leaves & shrimp). This was fantastic. The curry was spicy but not overwhelming . All of the ingredients were really fresh and perfectly cooked. I could eat this dish 3-4 times a week. They did a really nice job on the shrimp. If you go and you like coconut curry it is a must order item in my opinion. 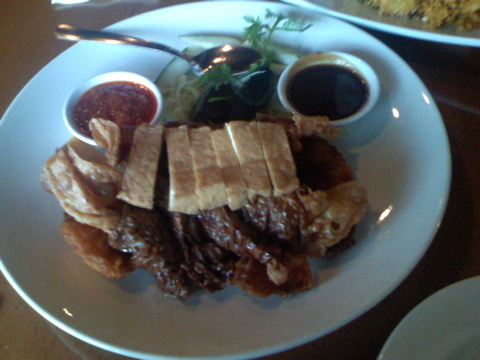 We also ordered the VOLCANO PORK RIBS (Fried & served with Malaysian barbeque sauce). The dish is presented flaming. It is difficult to see in the photo. All around the aluminum foil is a low burning blue flame. The ribs were baby back ribs covered in a sweet sauce. I enjoyed them but would not order this as my entrée since it comes with no vegetables at all. It was a nice dish to share. Peninsula has a nice selection of Asian beer. I was more impressed with the fact that the beer was fresh and did not smell skunky from improper storage. It seems like every time I order a beer of this variety in a restaurant it is bad. I rarely drink wine with this type of food so it was a nice detail. Overall I think that Peninsula offers some of the best Asian food in the city. 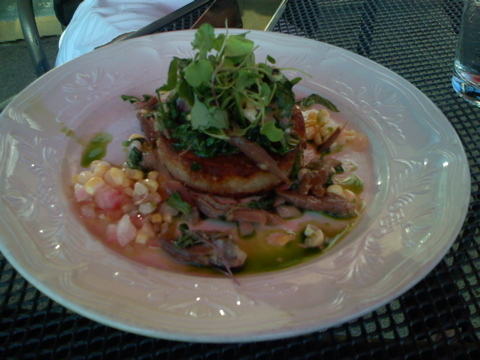 OK so I stopped into JPs for a drink and they were kind enough to let me sample their new Risotto Cake with Duck Confit. This was making me really disappointed that I was going somewhere else for dinner. I really enjoyed this dish it would be a great starter on a warm day. Light, fresh and flavorful. The sweet corn and sherry vinaigrette were a nice touch. 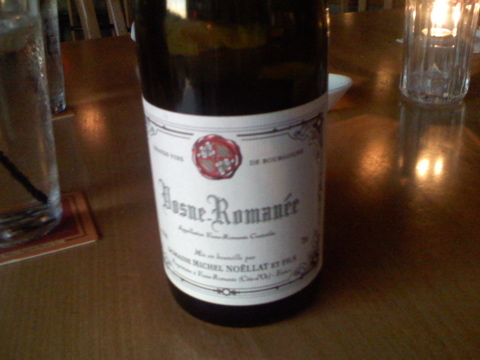 Also…if you are in the mood for a nice Red Burgundy I would highly recommend the domaine noellat, fixin ’02. It is a very versatile wine and seems to go well with most things on the menu. We had an awesome meal at Saffron Restaurant in Minneapolis. Saffron is a Mediterranean and Middle Eastern Inspired restaurant with a French sensibility. The restaurant is located on 3rd street North right across the street from 112 Eatery in the old Jazzmine’s space. Those that have lived in the city for a while will remember that Café Solo also occupied that space at one time. There are few fine if any fine dining restaurants that offer this type of cuisine in the Twin Cities. What impressed me most was our server’s understanding of the menu and his ability to pair wines with the dishes. He recommended that we share all the dishes. This was a nice way to evaluate the range of the menu. We will be going back again to sample more of the menu. Our server recommend several items. We started with the traditional Mezze. 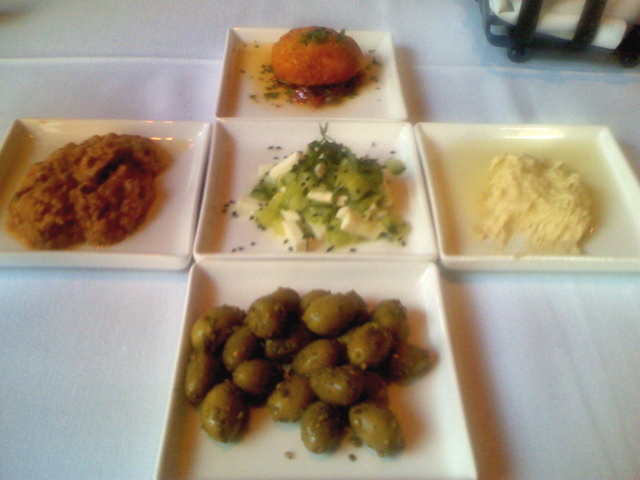 It was a collection of small plates that included Turkish Olives, A cucumber salad with Persian cheese, a spicy eggplant concoction that I can’t remember the name of , hummus and a perfectly prepared breaded scallop. The scallop was the hero of the bunch. I highly recommend this if you go and they are offering it. Next we shared the Green Salad. While the title does not sound all that inspiring, the dish was really good. 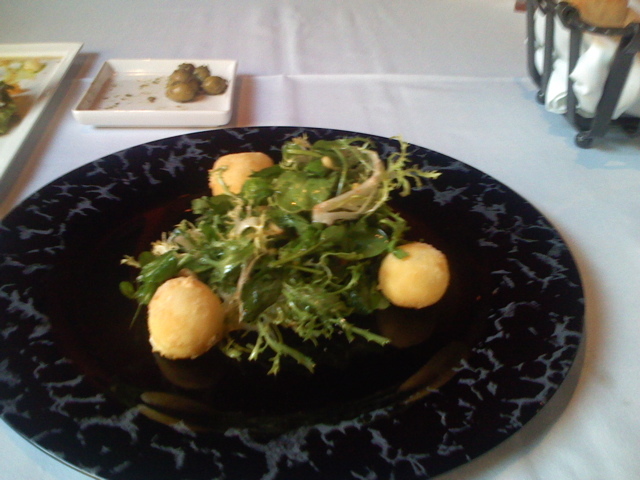 Simple in presentation served with roasted grapes, banyuls vinegar and goat cheese fritters. If you are a goat cheese fan you’ll love this. 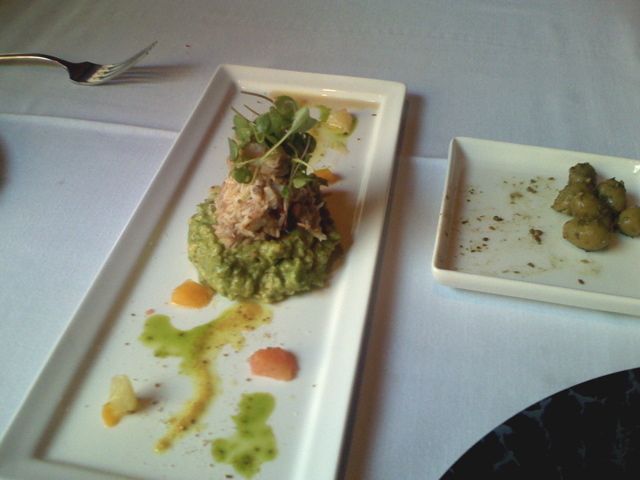 We also tried the Blue Crab Salad with Spicy Curry, Avocado and Citrus. This was a nice dish for a hot day. It worked reasonably well with the White Bordeaux the server recommended. 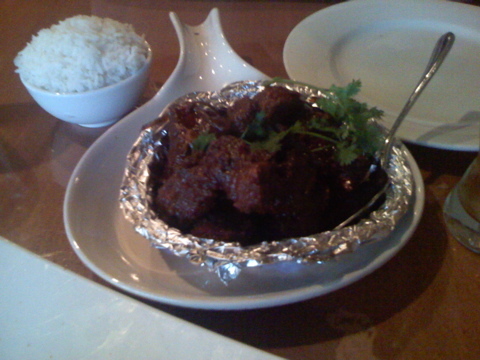 The curry was not all that spicy but it was flavorful. I enjoyed the hints of citrus throughout. We decided to share a main course and went with Beef Strip Loin. 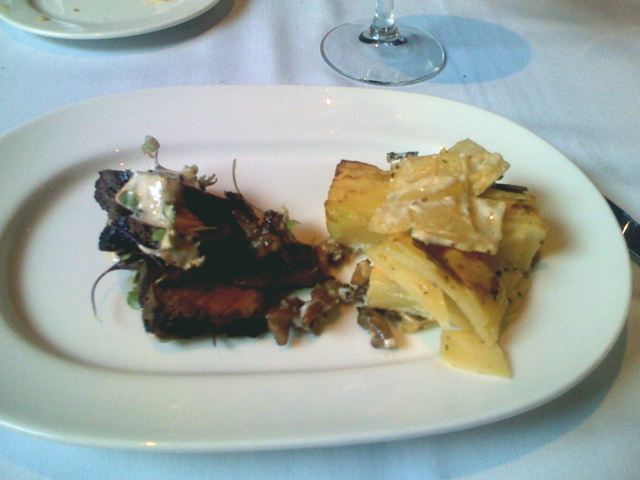 It came with a smoked potato gratin, oyster mushrooms and a taleggio fondue. I was sold as soon as I saw talleggio fondue. There was no way I was leaving there without trying that. I love tallegio and it is not often that I see it used as an ingredient item on a menu. I am a big fan of using it in risotto. Needless to say it was really good with perfectly prepared beef and potatoes. Our server paired a huge Malbec with this and yes it was as big an chewy as the cheese was. 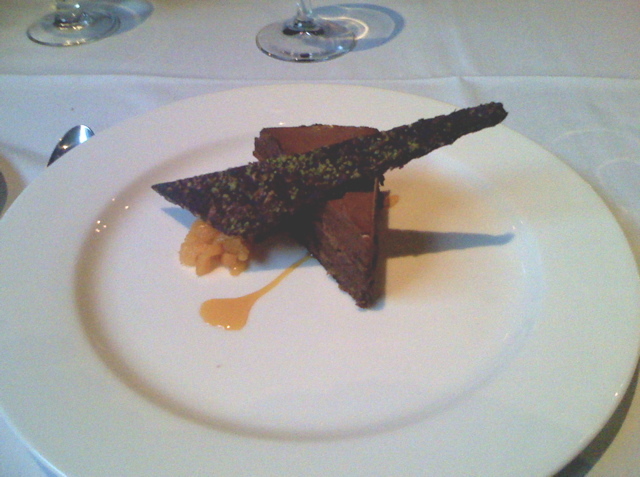 For dessert, we tried their chocolate mousse cake. Overall I would say that dessert was the weakest part of the meal. It was good but nothing about it blew me away. I would have been fine with more Taleggio fondue and a spoon. I will be interested to see how this restaurant evolves. The location is difficult and parking can be challenging and inconvenient even though the 4th street ramp is nearby. It is great to see a new fine dining restaurant that is not a bistro, Asian or Italian inspired. I have my fingers crossed for a more formal tasting menu a Saffron in the future. Just received the new Summer menu from JP’s. Looks like some interesting new stuff on there. I am particularly happy to see a new hangar steak preparation. We first went to Brix last September. After my visit there I decided to wait for a while and make a return visit to see if they had made any improvement. I had been getting some feedback that others had decent experiences there. Overall our return visit to Brix was better. A big reason for this was our server Damon. He seemed to be fairly knowledgeable and made some good wine and food recommendations. The wine selection seemed to be improved. My biggest complaint is that they do not have any vintage designation for any of the bottles. I guess I can understand this for a $20 bottle of Walnut Crest. But for a $250 bottle of Opus One…it seems odd and as if they are hiding the fact that they can’t turn over their wine inventory…Or they carry a very limited inventory. Brix does offer a large selection of wine for $20 per bottle. I think this is a nice way for someone interested in learning about wine to experiment with the different varietals. The bottles I did recognize can be purchased in the store for under $7. We began our meal by sharing the Goat Cheese. 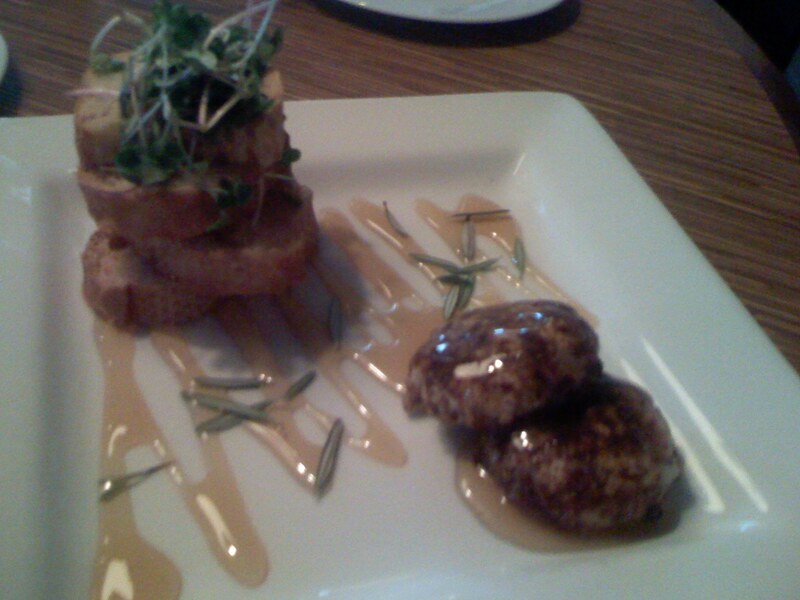 There were 2 goat cheese medallions encrusted with pecans served with crostini and rosemary honey. It was a nice way to begin the meal. Next we move onto the salad trio. 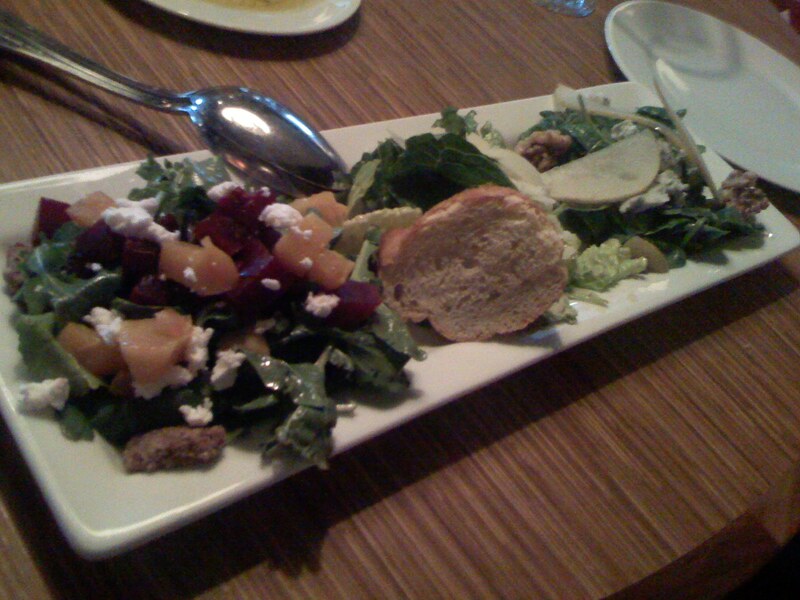 The beet and arugula salad was good. Fresh and seasoned well. The golden and red beets gave it a nice contrast. The Cesar was not good at all. It was overdressed and tasted fishy. Not in a good salty anchovy way but in an old not so fresh anchovy way. The Pear and Gorgonzola spinach salad was good. My only complaint was that the pears were hard, woody and added no value to the salad. We went with the specials for the main courses. 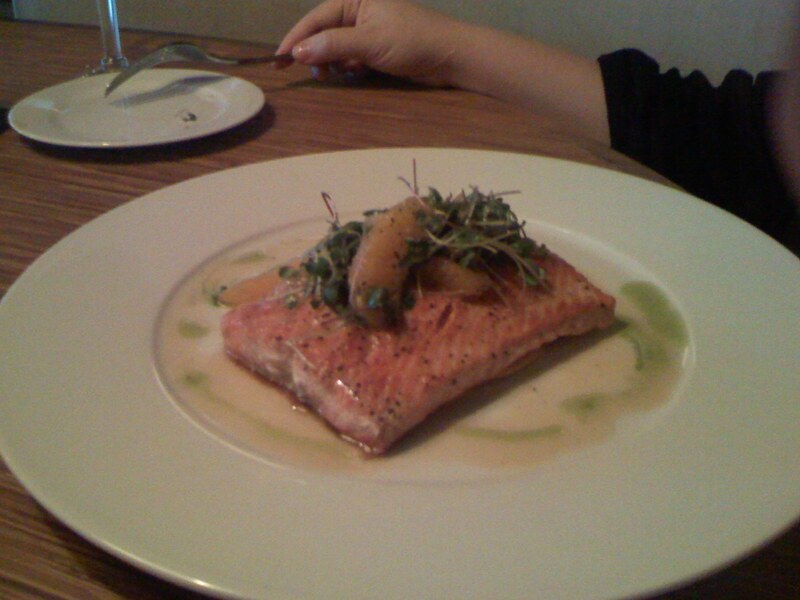 We tried the Citrus Copper River Salmon and the Chilean Sea Bass Cartoccio. Our server recommended we order the Salmon medium well instead of the chef recommended medium rare. I still question whether this was because the fish was not as fresh as they would have liked or because like he said “cooking it more will make it pick up more smokiness”. It was reported that the dish was very good. I am highly allergic to salmon so I did not try it. The Sea Bass was good. 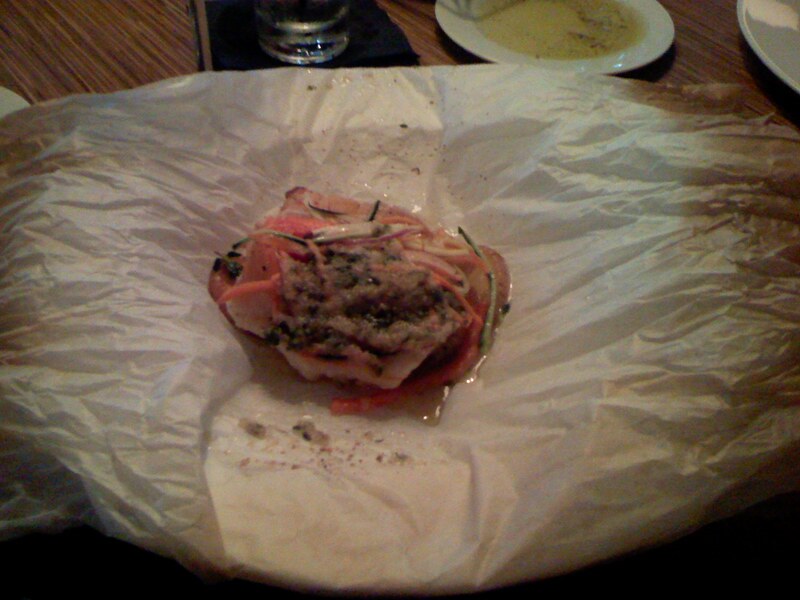 It cam baked in parchment paper. The potatoes and vegetables were prepared well. I thought they did a nice job on this one. Damon paired a very nice pinot grigio with this. I am not usually a fan of this variety but it worked well with the dish. We ended up skipping dessert and went for cappuccinos instead. They were fine. Not great but not bad either. Overall Brix is a better restaurant then it was 9 months ago. I still think that a restaurant that is focused on wine needs to take the wine more seriously. Another thing that bugged me was they brought our entrees before we were finished with our middle course. Since we only ate 2 of the 3 salads in the trio…it felt as though we were being rushed. I also had to wait halfway through my main course for another glass of wine. Wine by the glass is one of the highest margin items in a restaurant. You would think they would want to sell me as many as possible. If I were in the neighborhood and looking for a quick bite, I’d probably go back to Brix. That said…if I want a psudo-Italian meal of this variety, my first choice would be Caio Bella. Got out of my Open Table rut and made a reservation at Restaurant Alma the traditional way…by phone. Under the radar in a lot of ways, I think Restaurant Alma represents one of the best fine dining values Minneapolis has to offer. It is clear to me that the ingredients are the best anyone can find around here. I also liked the fact that they were nice people to deal with. Our experience there was genuine, not too trendy and I felt that they were really passionate about the food. There was not a course on the list that I did not enjoy. Though to be honest I did not try the salmon due to the fact that I am allergic to it. The stand out dishes in my opinion were the marinated yellow tail. This was exceptionally fresh and a great way to open. The fish was not cooked but marinated. I found the pickled vidlia a nice complement. The Heirloom Yellow corn grits were a huge surprise to me. This is not something that I would usually order. It was light and flavorful. The grits had a great texture that worked well with the wild mushrooms. The perfectly poached quail egg was a very nice added bonus. The most delicate dish we had was the Almond Lavender Panna Cotta. It was beautifully balanced floral/nutty/creamy flavor. If they have this on the menu and you want something besides chocolate…it is a must have item. Coffee was outstanding as well. Apparently chef Alexander Roberts’ new rotisserie, Brasa, is now open at 600 East Hennepin. The phone number is 612-379-4909 and the hours of operation are 11a.m.-11p.m. Mon-Sat. I would be interested to know if anyone has dined there and what their experience was.